By buying this product you can collect up to 12 loyalty points. Your cart will total 12 points that can be converted into a voucher of Rs. 1.20. Jyeshtimadha is the main ingredient in this medicine which is frequently used in all ayurvedic medicines.Tanvijyeshta helps in Acidity, heat disorders, mouth ulcers, eye & feet burning etc. on various heat complaints.Tanvijyeshta can be taken in stomach pain, intestinal swelling, intestine roughness, piles, bleeding. Tanvijyeshta is effective in cough, cold, Asthamatic conditions, cough allergics, headache etc in combination of Santhakaphaa 1/4, Tanvishataa 2, Tanvijyeshta 1, Vatshaanti 1 twice a day as required. 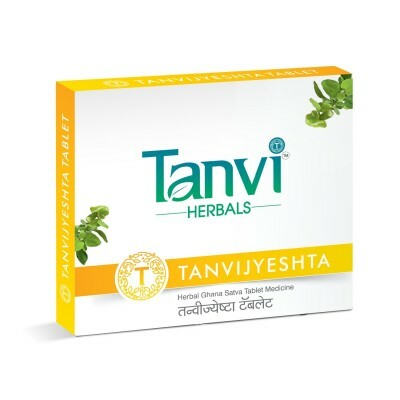 When vising is more take Tanvijyeshta 1 to 4 tablets extra after every half an hour till you get the relief.In harsh voice, voice disorders, throat cough, skin allergies, swelling, acidity & urinary complaints Tanvi Jyeshta is very usefull.